HOME /Blog /Horse Mechanoid, UGears gracious quadruped! Horse Mechanoid, UGears gracious quadruped! UGears introduces another model in this season’s collection, the Horse Mechanoid 3-d puzzle! This model consists of 410 pieces and, despite the lengthy, almost 15-hour assembly process is a real delight to build and play with. UGears Horse Mechanoid is a complex self-propelled mechanism of a mechanical walking horse with a luxuriously free-flowing mane and tail. Designed on a prototype of a real horse, the Mechanoid features exterior body proportions, posture, and graciousness of this majestic quadruped. But, the most astonishing feature of the Mechanoid yet, its ability to move on its own! How does the Horse Mechanoid work? When the model is assembled and ready to be used, look for a key located on the side of Mechanoid’s body. A few turns of the key will crank-up the model’s rubber-band motor, activating the motion-producing mechanism. Simply release the lever and watch your mechanical horse trotting ahead, just like a real-life equine! The Mehcanoid’s self-propelled mechanism is a complex system of gear drives, levers, and hinges that transmit rotational motion to the Mechanoid’s legs, ensuring a certain logical order of their movement. At first, Mechanoid may seem lacking stability and balance. 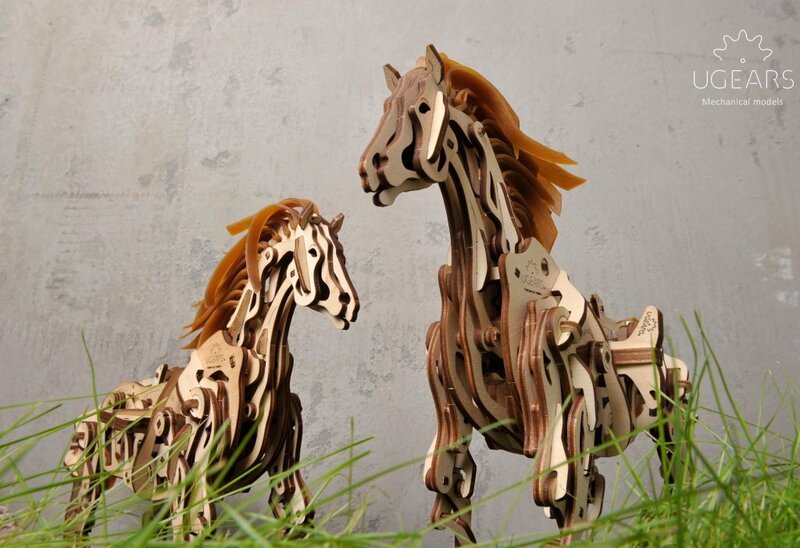 However, you’d be pleasantly surprised when see this mechanical equine galloping along the top of your dining table or a living room floor, steadily grounding its hooves into the surface. This kind of balance is achieved with a thought-through engineering design of the Mechanoid. 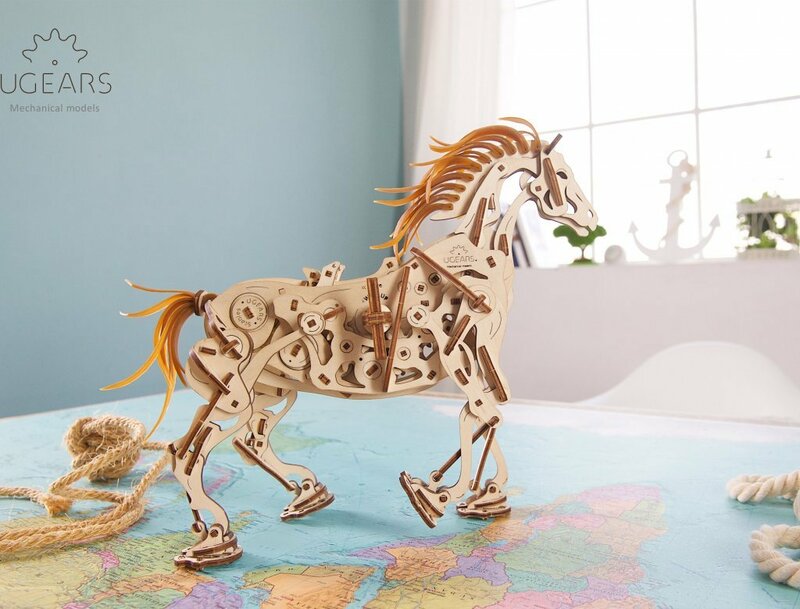 To ensure the model’s stability and smooth movement while in motion, UGears toy building experts calculated the centers of gravity, synchronized the alternating motion of the front and hind legs, and gave the horse its wide hooves. Just like all UGears 3-d puzzles, the Mechanoid is made with natural wood materials and is assembled without the use of any glue! 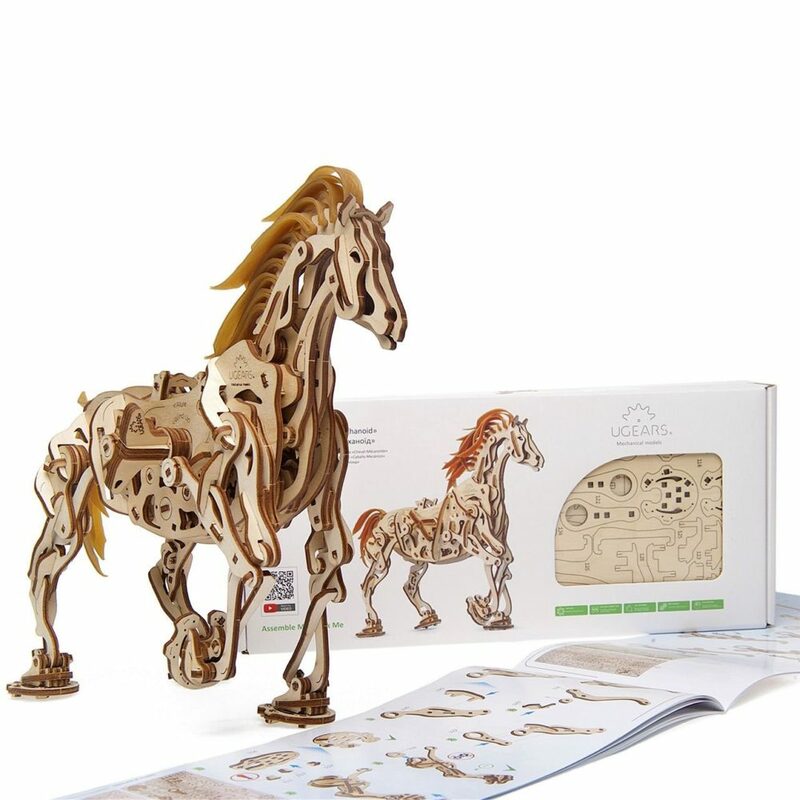 The Horse Mechanoid model is now available for orders from our website, where you can also find many other UGears 3-d puzzles, including the featured models of the season! 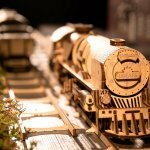 V-Express Steam Train with Tender – experience the power! 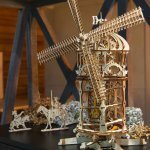 UGears Windmill Tower – subdue the wind power! Join with newsletters, updates and more.